BBC Scotland understands operators Ineos and the Unite union have failed to agree a halt to an impending strike by workers at the Grangemouth plant. It therefore looks like Ineos will have to proceed with closing the plant which they say will take 4 weeks to restart. We'll be back with a fresh thread in a couple of hours. Wednesday lunchtime and Ineos are still meeting with trade unions seeking a settlement. Fuel runs out at some gas stations - according to the BBC news. Some background on The European Gas Market. According to this report by CNN, BP has confirmed that the Forties pipeline system may have to close if the Grangemouth strike goes ahead. 700,000 bpd UK North Sea production may be lost. In addition to lost oil production, many gas fields may also have to be shut down as liquids produced with the gas will have no export route. More news on natural gas production if it is confirmed that the strike will go ahead. Ineos is reported to be the world's third largest petrochemicals company. Privately owned by UK businessman Jim Ratcliffe. Management and trades union officials at the Grangemouth refinery in Scotland are to meet on Tuesday at the ACAS conciliation service for talks to avoid a strike planned at the weekend, a union official said. "There's a party going to ACAS this morning for a meeting at 2 pm," Gordon Russell, a union convenor at the refinery for the trade union UNITE. Russell said management had made no new proposals at talks with the union on Monday evening to avert the strike called over the 200,000 barrel a day refinery's pension scheme and the two-day strike was still set to go ahead on Sunday. "Everything stays as it is pending the discussions," he said. The planned strike at Grangemouth was one of the factors driving oil prices to a record high on Monday. Refinery owner Ineos has started closing one of the refinery's three crude processing units as part of a safety shutdown ahead of the strike. A shutdown at Grangemouth would reduce flows of North Sea crude into Britain and hit British gas supplies, if the Forties pipeline, which feeds the refinery, is forced to close. Roads are visibly quieter around Aberdeen today. Motorists have been urged not to panic buy fuel amid warnings that the shutdown of Scotland's only crude oil refinery could lead to shortages. Ineos claims it could have to close its refinery at Grangemouth for a month on safety grounds ahead of a strike by 1,200 members of the Unite union. Industry analysts told the BBC that there is no need for drivers to stock up with petrol at the pumps. We welcome your input on developments, resources, and links to other/related stories in the area. Thanks. Its unclear what the magnitude of this story will be, though oil markets did spike when this was announced on Friday. No new news on wires in over 12 hours, though Bloomberg is reporting that the 'point of no return' is now 4/24-4/25. Is it possible that this is political cover for emergency maintenance or some such? Is this linked to financial situation re: pensions? Anyone with insight or updates, please comment. Up to 1,200 employees at the Ineos refinery will walk out on April 27 and 28 in a row over pensions. The article goes on to say Ineos has already started shutting down the Grangemouth refinery. In Scotland, Ineos warned that it had started shutting down the refinery at Grangemouth so that it is safe during the strike. This would effectively close it for a month. I spoke with our UNITE union rep (I'm an engineer in Scotland)and it is a genuine grievance. Uh-oh, the government said to remain calm. Now we're really in trouble. And so the picnic begins. I didn't see it quite as busy in this in the city yesterday, but then again there are less petrol stations outside Edinburgh than in the city itself. Grangemouth refines approximately 10% of the annual UK road fuel consumption. There will be panic buying, not only in Scotland and Northern England - but it will likely spread to other parts of the country. The 67 days reserves will be depleted initially at a greater rate than normal, causing fuel distibution problems. Expect another rise in price at the pumps. Diesel has already reached £1.20 at one Texaco station in Surrey. Rapeseed oil is 98p/litre in Sainsburys - I expect more than a few are tempted to used a diesel/rapeseed mix in their tanks. In Germany, this has actually occurred over the last few years - and it is illegal, since the fuel tax has not been paid. And pretty hard to hide - the exhaust has a certain 'Duftnote' or scent. Interesting - German police will still occasionally check fuel tanks (mainly trucks) to see what is in them. There was a person selling rapeseed oil near where I lived, but according to a local fuel seller (who does sell biodiesel), he was shut down because the taxes involving burning fuel for road use were not paid. Apparently, the British perspective is more along the lines of little fish always swim free anyways, so why bother? Especially in regards to how stores that sell vegetable oil do not need to register. I'd guess a truck could easily use more than the 2,500 litre limit though, so the owner should either have paid the duty themselves or bought it from a supplier that was paying the duty and gave them a receipt to say so. Personal use is fine though, and as a supermarket is not selling oil as fuel it doesn't affect them. I heard that HMRC was spending in the region of £100 to process each duty payment, but the cheques they were receiving were often only for £10 or so! Also, they'd found that the number of people registered as biofuel producers had gone up from less than 10 at the start of the decade to a couple of thousand, so I guess what was a Friday afternoon task once a month had suddenly become a full-time job! Anyway, I'm happy, because my car has a conversion to burn neat veg oil as well as diesel :-) I don't normally burn food-grade oil, but if there's a fuel shortage I have the option. Interesting point about veg oil sales in the UK. Last year I was able to buy veg oil (for cooking) for about 38p/litre. Once it became legal for individuals to walk into a supermarket and buy veg oil for their cars the supermarkets quickly found that people were coming in and buying a whole shelf’s worth of veg oil in one go. They were, in effect, selling fuel at 38p/litre. As the next cheapest option is normal diesel at 105p/litre, the supermarkets quickly moved to price food grade veg oil on parity with diesel. A good example of how biofuels will be priced at the exact same price as their closest competitor regardless of how cheap they are to produce, due to their miniscule sales volumes. Much of the UK's gas supply (st fergus) is controllled at Grangemouth, our analysts are predicting the strike will not be allowed to go ahead on the grounds of security of supply (for gas) rather than any oil/petrol shortage. The gas comes through Kinneil terminal and not at the refinery. Unless the union operates both and is specifically shutting both Grangemouth and Kinneil down, then the strike might not impact gas production. From what I have read it's the condensate in the gas that is the problem - the refinery deals with that. According to the BBC mid afternoon Wednesday some gas stations are out of fuel and prices are rising, whether the strike goes ahead or not! The forecourts are stacking up significantly in and around Aberdeen right now. The dispute by staff and managers at the Grangemouth oil refinery is leading to growing pressure on commercial fuel consumers, it has emerged. Ferry operator Caledonian MacBrayne said it may restrict services from Thursday to conserve fuel supplies, if the planned action goes ahead. Scotrail, which gets all of its fuel from Grangemouth, said it was monitoring the situation closely. Negotiations to resolve the dispute are currently being held at Acas in London. Up to 1,200 Grangemouth workers, who belong to the Unite union, plan to strike on Sunday and Monday over plans to change their pension scheme. Ineos, which operates the refinery, has begun shutting down the plant, which processes 210,000 barrels of oil a day. I have a hard time believing this strike and associated outage will occur. In recent times the British have been particularly poor at striking compared to our continental friends. Given the ramifications of such action, I'm fairly confident that "something" will be agreed to avert the direct action. However as we move forward over the next few years and the economic and energy situations deteriorate, it's situations like this that are likely to cause the most immediate damage. I'm just hoping it doesn't start this week! Given this assumption what can we do to alleviate any short term shortages? "Bury full Jerry cans in the garden"? The strike is by the refinery operators. It is not clear if the oil and gas flowing through the refinery to other destinations will be affected. It is clear that the oil company is talking up the panic as much as possible, talking of scotland being without fuel for a month, and no mention of reserves, imports, or the fact that the refinery only produces 10% of UK fuel. On the radio (Radio 4) this morning the operator did have to backtrack and talk of 2 to 3 weeks to restart the refinery. I don't doubt that the refinery is struggling with margins at $117 oil, but UK drivers are even more inelastic in demand than in the US due to the high taxes. We are used to $8 gas, $10 gas won't stop us driving. I would find it deeply ironic, given that PO is going to make all pensions worthless, if a pensions dispute was to trigger turmoil in the UK . There is no mention on the media of the price of oil at the moment, or the fact that diesel is in increasingly short supply. It is true that a final salary pension scheme is very expensive for an employer in the long run, it is a huge perk, especially as it is the only type of pension likely to survive peak oil. (My dad has had a very comfortable retirement on one). That said, the company is simply cutting the wages of the workers in real terms at a time they are making record headline profits. I wonder how many people will support the Union - my understanding is that the pensions are non-contributory - nice, if you can get it! Most people in the UK don't have non-contributory final-salary pensions any more. The refinery and these workers are competing in a world market, what are the pensions rights and salaries elsewhere. Also, I think the refinery is expected to be loss making for a number of years and requires substantial investment. I wonder why BP sold the refinery in 2005? Bear in mind that UK North Sea oil production will be largely FINISHED by 2020, so maybe no requirement for refineries in the UK ... especially if we end up importing refined product. We expect the least profitable refineries worldwide to have to close once volumes fall away post peak, so refining is going to be very competitive very soon (if not already). Which makes me start thinking that the company is escalating this dispute as political cover for shutting down the refinery in the near future. That way they can simply blame the union/workers for sabotaging the profitability and get away with lower redundancy payments and less political blowback. Also, this could be a dry run to see how well Scotland can be supplied with fuel from other existing sources. Whilst 10% might appear a trivial amount, it might prove difficult to make up that quantity from other sources - particularly if these are unavailable or already overstretched - in the case of diesel. Some of the more experienced data crunchers on TOD will have a better knowledge of the likely effect of what happens when demand exceeds supply by 10%. As a population, we are prone to act irrationally, and although we may have reserves for 67 days, by European law, I am sure that there will be a considerable rush on the filling stations for the next few days and this will have a knock-on effect to the normal fuel distribution pattern. Additional fuel transport costs to the regions affected by the closure of Grangemouth will put up the pump price elsewhere, leading to an escalation of concern in other regions. The 200,000 bbl/day capacity of Grangemouth is about the same amount of motor gasoline that the US imports from the EU, UK, and Norway. If everyone in the UK rushed to fill their tanks, MOL would be breached, and the imports to the US stopped or slowed, in order to rebuild stocks. If that spills over regionally into the US, then certain areas receving those imports could experience spot shortages, resulting in panic filling, resulting in a breach of MOL, resulting in a cascade across the country. Not too hard to imagine a worst case scenario playing out, if panic anywhere sets in. Fears were growing last night that Britain could lurch towards another fuel crisis. As forecourt prices hit record levels and oil went above $117 a barrel, campaigners said they were secretly planning a series of blockades in an attempt to bring the country to its knees. Angered by the Government's planned 2p rise in fuel duty, they pledged to recreate the chaotic scenes which saw tens of thousands of drivers panic-buying in 2000. BTW: I thought Refinery blockades were now covered by anti-terrorist legislation? Don't panic Mudlogger - the economy is fundamentally sound. Resiliance has been built in at every possible point to help us get through situations like this. You mean like the sound advice I get from my wife? - 99% sound, 1% advice! BTW, INEOS is private equity, run by the UKs 10th richest man Jim Ratcliffe, last year it led the Sunday Times KPMG Top Track 100 list of Britain’s private companies by sales. Mr Ratcliffe’s past experience of brinkmanship should also serve him well in the present dispute. In 2001, Ineos threatened to close its chlorine plant in Runcorn, Cheshire, unless it received a government grant. Two years later the Government agreed, handing over £50 million. The goverment bought Northern Rock and is now lending (against secure assets I may add)a further (initial) 50 billion to the banking sector. UK PLC must be rolling in money (or debt) to afford all this. Maybe some private equity company will buy the UK and save the day! The good thing is that tax payers money will not be put at risk under any circumstances (reassurance). Its hilarious listening to all this Bull Sith from the government et al, they must think the entiire nation came down the river on a banana boat. Does Grangemouth lie in Gordon Brown's constituency? UKPop are not in good shape. I suspect the forced dismantling of unions will happen more frequently in the future as energy supplies get more scarce. I'm sure Blackwater (TM) would gladly accept a fat contract to bust the union and make Britain 'safe' for freedom loving souls again. Thanks for the link, Mudlogger. What I found particularly interesting were the readers' reactions (48 comments at this writing – way above the average for the Daily Mail, incidentally). No mention whatsoever of peak oil or oil depletion. No, it's all the government's fault and that's all there is to it. Though commenters seem to disagree as to whether what is needed is more or less government intervention. Peak oil awareness raising still has a long way to go. Number of Daily Mail commenters on Petrol Panic report now up to 63. Oil lives under the sea for free. Establishing wells costs money, pumping it costs money, refining it costs money but these costs are in the region of 3p a litre [...] Make no mistake we don't "need" to be tied to any global prices. They are 20 deep at the Bridge of Don Aberdeen ASDA Petrol station at present. ''oil lives under the sea for free''. The Forties Field, discovered by BP was the first giant field to be brought on production in the UK. This spurred BP to build the Forties pipeline system which fed oil to their refinery in Grangemouth - by Kinneil Terminal on PG's map. So back in the 1970s BP owned the oil field and platform, the pipeline and the refinery. In 2003, BP sold the Forties Field to Apache Corporation. Production peaked at Forties at 29,000,000 M3 per annum back in 1980 and by 2003 that had fallen to 2,400,000 M3 per annum. About the same time BP sold their refinery at Grangemouth in stages to a company called Ineos. A cynic may think BP were trying to get out of the oil industry - they also invented the slogan Beyond Petroleum. BP still owns many fields linked to the Forties pipeline such as Andrew, ETAP, Bruce and many more. But the only large chunk of the original infrastructure that they still own is the pipeline that earns a fortune through tariffs. Is over a pensions dispute and I suspect we will see many more disputes of this sort in the years ahead as pension funds fall very far short of the make believe promises made to employees. Ineos I believe is a quite large private company that seemed to appear from nowhere about 5 years ago. Anyone got more information on them - who owns them and how well capitalised is the outfit. How much debt do they have? Can Ineos survive this dispute? I think this is likely the least of our worries. I gather the UK has ample stocks so it is really a distribution problem. Aberdeen receives fuel via coastal tanker - so hopefully that can simply pick up stocks from else where. One thing I'm not sure about is the knock on effect of shutting Grangemouth upon oil and gas production throughout the Forties gathering system. Grangemouth processes about 200,000 bpd and a lot of that is liquids from gas and gas condensate fields. If all this has to shut down because there is nowhere for the liquids to go then we will be in big trouble with gas supplies already stretched. * INEOS urges Union to keep open deep-water jetty and allow tankers to supply Scotland’s fuel during dispute. INEOS is disappointed that the UNITE Trade Union have today turned down an invitation by ACAS to attend talks to help solve the Grangemouth dispute that will disrupt fuel supplies to Scotland and the north of England. Tom Crotty, INEOS CEO, says: “We have always made it clear that the company is ready to attend talks at ACAS to help end the current dispute. It is extremely disappointing to hear that the UNITE Trade Union is not willing to involve ACAS at this stage. The union’s planned strike could have significant consequences for Scotland and the north of England and we would urge them to work with us to find a way of resolving this issue”. INEOS is now writing to all 1350 Grangemouth employees asking them to accept a new set of revised pension proposals. The company is urging the union to call off its strike scheduled for 27th – 29th April and engage in meaningful negotiation. Because of safety issues, this strike will effectively close the plant for a month. The letter has been written by Tom Crotty, CEO INEOS Olefins, and details many of the concessions made by the company in an attempt to reach agreement on the pensions issues at the heart of this dispute. In a separate development, INEOS is asking union representatives to reconsider the company’s proposal to allow fuel to be brought to its deep-water jetty during the strike and allow tankers to supply Scotland’s fuel during dispute. For this scheme to work, the union would have to allow some of its members to operate the jetty and would also have to agree to keep open parts of the plant. In the meantime, INEOS has to continue to prepare for a total shut down of the refinery and petrochemical plant by next Friday in advance of the strike action to ensure that the facility is as safe as possible during the strike. Impact on fuel production from the site will start tomorrow (Monday) when the first of the site’s crude oil units is shut down. The dispute centres around INEOS’ determination to make Grangemouth a competitive long-term business. Addressing the pensions issue is part of this process. Currently over a quarter of the entire money that INEOS spends on employees at Grangemouth goes into the pension scheme and independent experts say that this figure could rise to almost 50% going forward. This figure is excessive and unsustainable in the longer term. INEOS is proposing to retain a final salary scheme for all existing members, paying 1/60th salary for every year worked, still an attractive and competitive pension scheme compared to other pension plans across ons in the country. INEOS will still pay the lion’s share of the costs, but for the first time the workforce will have to make a contribution to their retirement. INEOS has proposed a 6% employee contribution, phased in over the next 6 years. This will still leave employees in a better position than the majority of UK private company employees. The company proposes a different plan for future new employees but one that will continue to allow it to attract highly skilled workers to the Grangemouth site where the typical remuneration package for a qualified technician is valued at almost £60,000. INEOS wants to invest in Grangemouth, but the conditions need to be right. Hmmmm .... S&P Credit Research - "At end-September 2007, adjusted debt was high, at about €8.9 billion,"
Thanks Xeroid - I had also wondered about "private equity" which of course means stash loads of private debt. How to hell do you become the third largest chemical company in the world from nothing in just 10 years? I'm left wondering how high oil prices (feed stock), high energy prices, higher interest rates and severe currency fluctuations affects a company like this - especially if they hedge and get it wrong. I also wonder if its possible to shut a refinery and restart it? Need to get a view from RR on this this one. It all smells a bit "Cedric Brown" to me..
Sure, that's not an uncommon situation. But it can take a week to bring it back up. It seems a fairly typical instance of the destruction of pension in the UK over the past decade. The company looks at the long term liability and the uncertainty in future earnings/stock market/etc. and wants to shift the risk to the employee. The employee sees this as an obvious attack and strikes back to ensure their old age isn't one of poverty. My guess is this particular instance will result in the company giving in, but that the basic change will reappear in future years of recession where the workforce strength is diminished. The basic issue, the inability for most to successfully prepare for old age in the climate we live in remains unaddressed. Pity the £50bn in bank baleouts isn't going towards fixing some of these systemic issues. The Grangemouth refinery processes around 20% of the crude from the Forties system, said the spokesman, with the remainder going into storage for export by tanker. In the event of a refinery shutdown, "all the crude could go to export for a while," said the spokesman, although there is a physical limit to the amount of oil that can be stored at the export terminal. Scotland's St Fergus gas terminal, which supplies around a third of the U.K.'s gas, feeds some hydrocarbon liquids extracted from the natural gas into the Forties pipeline system. 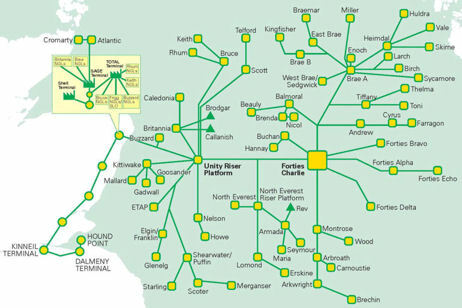 Royal Dutch Shell PLC (RDSB), one of the operators of the St Fergus terminal, was not immediately available to comment on the impact of a Forties shutdown on gas flows at St Fergus. "I believe that if the associated, liquid heavy gas can't be used at Grangemouth as feedstock, then they can't produce the natural gas (at St Fergus)," said a London-based gas trader. We will have to wait and see, best hopes for arbitration - such complexity, everything is linked to everything else, and probably dependent on a very few key people! Whenever it happens (this week or in the future) in the event of limited nat gas supply, for safety, I expect electricity power cuts - most central heating needs electricty to run, as does a lot of the power stations. There won't be any power (eletrical) outages. Scotland has 5 major power stations. 2 coal (Longannet+Cockenzie), 2 Nukes (Hunterston B+Torness) and one major gas (GTCC in/near Aberdeen). There is also many smaller gensets + all the hydro. Scotland can function happily without one, or even two of its major gensets, so if the big GTCC station in Aberdeen falls over then as both the nukes are turnin' & burnin' just now, we'll be fine. No, the power cuts are to stop the use of gas - you can't have gas pipes with no gas pressure in them. Norwegian gas also lands at St Fergus. So I don't see any gas supply problem as necessarily being local. But a significant reduction in UKCS gas production with selective closures of fields in Forties pipeline system may leave the UK scrambling for gas at the end of a winter that has seen record day ahead prices. Current day ahead is 63p / therm compared with 15p / therm a year ago. These high prices have persisted for months now. If anyone can send me a chart for the Herren UK gas day ahead prices spanning a few years I'd really appreciate it. If the strike is to go ahead then I may try to calculate the possible gas production loss. Click on the storage monitor and stock level data. It looks like long range storage (Rough) is depleted from 35,000 GWH t0 10,000 GWh over the winter and that medium range storage is depleted from 8,000 to 2000 MWh - and falling fast. Bottom line it doesn't look like there's much storage to call on. Bidding up the price of energy across Europe no doubt. Winter 08/09 gas contract broke 80p/th on monday - this is a new record. Not at work at the mo but I'll try and have a look for you next time I'm in. The Scottish interconnector is at 50% at the moment as NGC are doing some upgrade work. I think the CCGT people are talking about is Peterhead - she's currently doing about 1.2 GW, which is a very significant slice of Scottish generation. In ten years or so UK natural gas will essentially be at an end - can you spot the weak links in the supply system on your map? Xeroid, I got a big article on UK gas supplies coming up very soon. The weak link in gas supplies is um - not enough gas anywhere. It is notable that the Langeled pipeline was built to terminate in England - providing England with greater security of supply. 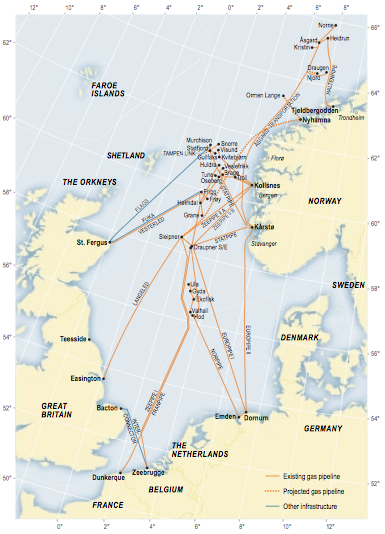 That gas, however, passes through the Sleipner hub and can be diverted to continental Europe. But he said the UK held 70 days of fuel in reserve which would be sufficient to cover the month that Ineos expected Grangemouth to be out of action. How much of that 70 day supply is taken up by the minimum operating levels? I very much doubt that even if there were a full 30-day shut down of supplies from the refinery that there would be any noticeable impact for the bulk of the UK population. Considering that, in the worst-case scenario, if all the products had to come from stored reserves, the UK's "buffer" would diminish by about 3 days. Considering that UK product reserves are at least 57 days, then the short-term impact is minimal. The more likely scenario is that there will be a diversion of UK refined products exports to the US back to the domestic market, and, perhaps, some diversion of European exports to the US to the UK instead. On oil products you might be right for the majority of UK population, but it has potential to be seriously disruptive in Scotland. Once panic buying sets in, it almost doesn't matter whether there is a real disruption or not - the panic itself can create a problem. While this sounds like an oil refinery issue, the UK impact is likely to be much greater on the gas side. Depending on the flow on impact of shutting the refinery, it's possible, though not certain, that gas production may be forced to stop if they can't export the liquids separated in the gas processing plants at St Fergus which do not have any liquid storage facilities. Earlier the BBC had a video showing a 'soccer mom' filling up for the second time in a day, then a government official who said that if the strike went ahead there would be shortages by Monday and that contingency plans wouldn't be able to meet the complete shortfall. Then he said that it wasn't a Scottish Government problem but a UK one - so if the strike goes ahead it's all down to 'Brown's Boyz' to save us! Best hopes for todays arbitration, it will not be until Wednesday or Thursday that a "point of no return" is reached when the plant will prepare to stop production completely. Oh, I see - suddenly they want to be part of the UK again ? Well, independence or bust, I say. What's that ? You need petrol in a hurry ? Plenty here at £5 litre, Jocko. When global warming bites, we will sell you water.
" range of factors including the uncertain situation at Grangemouth - one of the largest refineries in the UK - and attacks by militants on pipelines in Nigeria spurred prices on." Disruption in Nigeria would reasonably affect crude prices but closure of a refinery? If anything could this not be a potential depressing effect on crude oil price? This seems consistent with the typical mainstream media reporting of oil prices, which continually ignore supply side factors (i.e. peaking of supply) and punt the view that this is all down to the weak dollar. It almost smacks of a cover story. If the strike goes ahead the oil that would have come from Forties now has to be sourced and refined somewhere else (or come from strategic reserves which will have to be topped up after the crisis) - so, world demand of the 'Net Export' oil will suddenly increase by the amount normally produced by Forties, ~210,000 barrels per day, expect the prices to go up. Judging by Tapis today climbing to $124.55, there appears to be no slack left in the system any more. Wave height = System slack. I guess the question then is if the current energy situation is best described as dead calm or storm... Or maybe that is relative to the size of the pebble. I'm amazed by this secrecy about after all normal maintainance of refineries in the whole of Europe. Always fun to laugh at the Daily Mail -- though I'm sometimes dismayed by North American posters quoting from it as if it should be taken seriously as a NEWS paper, rather than a popular perception-management apparat for that section of the British public who think of themselves as a cut above the average red-top-reading prole, but too no-nonsense in their attitudes to like the hoity-toity, arty-farty broadsheets. The flood of comments from the punters shows, may I suggest, the degree to which they have been mislead and kept in the dark by their 'news' media of choice, so that they can actually take seriously the nonsense that they feed back to the very media which are deceitfully injecting it -- unnoticed -- into their minds in the first place. However deluded, these are fellow-humans who are going to suffer from their unpreparedness, and their unfamiliarity with the real story of what's happening, comprehensively concealed from them by the Permanent Bullsith Blizzard put out be such as the Mail hacks. Any TODers who don't already know it might like to visit Medialens fairly regularly, especially the Message Board and the Forum, for useful insights which mesh very well with the high level of insight displayed by the TOD communities. Medialens, as it says, "correct[s] for the distorted vision of the corporate media....." Useful synergising for the TODs. A strike which could close down Scotland's only oil refinery will go ahead after talks between the Unite union and plant bosses broke down. A union spokesman said: "Unite's negotiators were disappointed with the company's refusal to withdraw controversial pensions plans and therefore the two-day strike will go ahead. Ineos chief executive Tom Crotty said: "We have done everything we can to help resolve this dispute. "The plain fact is that the union seems hell bent on pursuing a strike that will cause chaos and disruption for the people of Scotland and across the UK." I posted an article on this matter on http://ergobalance.blogspot.com. However, I note (according to the BBC news this morning)that it is thought that basic operations will continue and hence the plant can be restarted within a few days, rather than being off-line for a month, as I had understood.